Teriyaki is a cooking technique used in Japanese cuisine in which foods are broiled or grilled in a sweet soy sauce marinade (tare in Japanese). 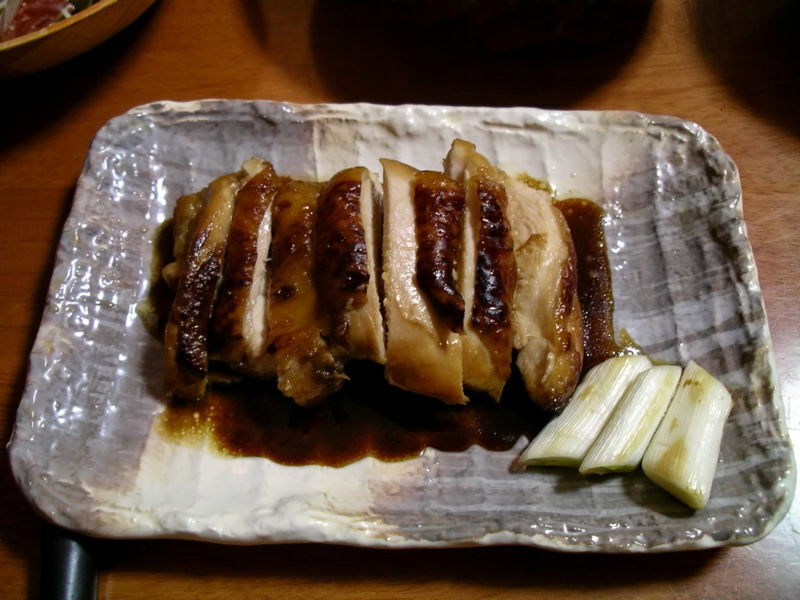 Teriyaki is served in most modern Japanese cuisines. Fish – yellowtail, marlin, skipjack tuna, salmon, trout, and mackerel – is mainly used in Japan, while meat – chicken, pork, lamb and beef – is more often used in the West. Other ingredients sometimes used in Japan include konjac and squid. The word teriyaki derives from the noun teri, which refers to a shine or luster given by the sugar content in the tare, and yaki, which refers to the cooking method of grilling or broiling. Traditionally the meat is dipped in or brushed with sauce several times before and during cooking. The tare is traditionally made by mixing and heating soy sauce, sake or mirin, and sugar or honey. The sauce is boiled and reduced to the desired thickness, then used to marinate meat which is then grilled or broiled. Sometimes ginger is added, and the final dish may be garnished with green onions. Teriyaki can also be served cold, as it often is in bento menus. In non-Japanese cultures, any dish made with a teriyaki-like sauce (often even those using foreign alternatives to sake), or with added ingredients such as sesame or garlic (uncommon in traditional Japanese cuisine), is described as teriyaki. Grilling meat first and pouring the sauce on afterward is another non-traditional method of cooking teriyaki. Teriyaki sauce is sometimes put on chicken wings or used as a dipping sauce. Teriyaki burger refers to a variety of hamburger, created by Japanese chain Mos Burger in 1973. According to the recipe, the tare is poured into the bread in limited quantities and coupled with lettuce, endowing it with its strong, yet sweetish, flavor. Since the late 1980s McDonald's in Hong Kong has offered a Teriyaki sandwich dubbed the Shogun Burger, where the teriyaki sauce is a coating on the burger patty. In Japanese McDonald's restaurants it is known as the Teriyaki Burger. From 2007 Burger King has offered a hamburger called the Whopper Teriyaki, in Japan only. Subway restaurants in Japan and several other countries also offer Teriyaki sandwiches.